The Lasallian Volunteers FSC Awards are a small way to show appreciation to individuals whose involvement in our mission makes our service possible. The recipients are honored in the spirit of three De La Salle Christian Brothers who embodied the Lasallian Volunteers’ values of Faith, Service and Community during their lifetimes. The awards are presented annually and will rotate between the Districts of the Christian Brothers to celebrate our national reach. 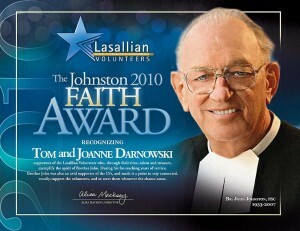 The Johnston Faith Award was named in honor of Brother John Johnston, FSC (1933-2007). 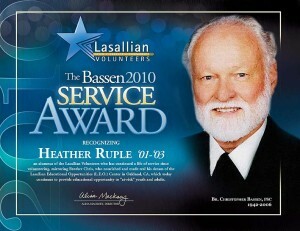 This award recognizes a supporter of Lasallian Volunteers through their time, talent or treasure. During his service to the Midwest District, the Region and eventually the Institute, Brother John was an avid supporter of the LVs. He made it a point to know what was happening with current volunteers, to vocally support the service LVs provided in Lasallian ministries across the country, and to meet them whenever the chance arose. The recipient of this award is a supporter who has expressed and/or demonstrated great faith in the work of Lasallian Volunteers. The Bassen Service Award was named in honor of Brother Christopher Bassen, FSC (1942-2006). This award recognizes an alumnus of Lasallian Volunteers who continues to live a life of service since his/her volunteer year(s). Brother Chris lived and breathed De La Salle’s mission of service with the poor. He nourished and made real his dream of the Lifelong Educational Opportunities Center (L.E.O.) in Oakland, California. The L.E.O. Center continues to provide educational opportunity to “at-risk” youth and adults who may otherwise not receive the assistance, guidance and resources they need. The recipient of this award is an alumnus of Lasallian Volunteers who has incorporated the value of Lasallian service with the poor into the fabric of his/her life. 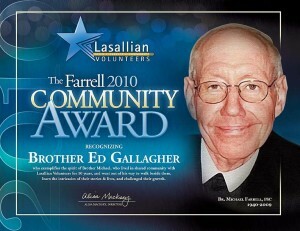 The Farrell Community Award was named in honor of Brother Michael Farrell, FSC (1940-2009). This award recognizes a Christian Brother and/or Lasallian Partner who has lived with Lasallian Volunteers in community. Brother Michael lived in shared community with Lasallian Volunteers for 10 years. While living with LVs, Brother Michael went out of his way to walk beside them, learn the intricacies of their stories and lives, and challenge their growth. All the while, he invited and expected LVs to do the same. The recipient of this award is a Christian Brother and/or Lasallian Partner who holds the community experience in high esteem for himself/herself and shares it with the LVs.